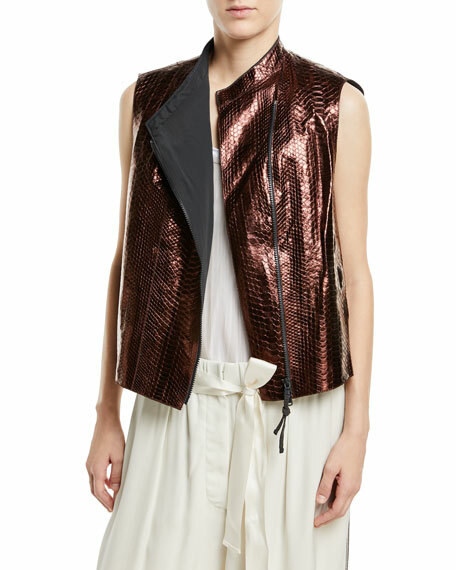 Brunello Cucinelli vest in glossy python. Majestic Paris for Neiman Marcus vest in camo-print. Stand collar; front zip. Side slip pockets. Slim, slightly cropped silhouette. Viscose; polyester fill. Hand wash. Made in Portugal of French material. Model's measurements: Height 5'10"/177cm, bust 33"/84cm, waist 25.6"/65.2cm, hips 35.8"/91cm, dress size US 2-4/FR 34-36. 9GG, 2-ply vest in variegated rib. Shawl collar; open front. Sleeveless. Relaxed silhouette. Asymmetric hem. Cashmere. Dry clean. Imported. Model's measurements: Height 5'10"/177cm, bust 33"/84cm, waist 25.6"/65.2cm, hips 35.8"/91cm, dress size US 2-4/FR 34-36. 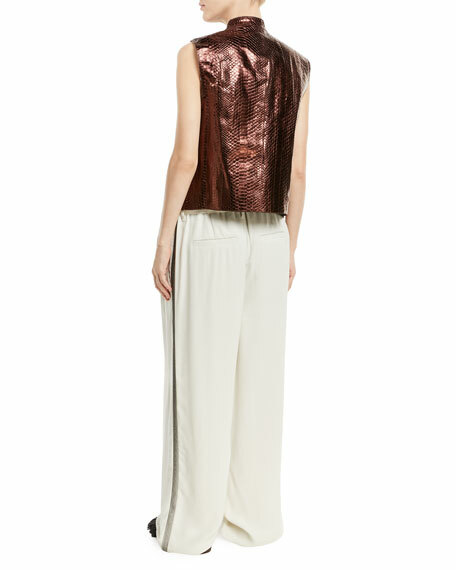 Oscar de la Renta gilet in bleached fox fur (Finland) with dyed contrast fur stripes at waist. Silk chiffon inserts. Oscar de la Renta gilet in bleached fox fur (Finland) with dyed contrast fur stripes at waist. Silk chiffon inserts. Sleeveless. Chubby silhouette. Hem hits high hip. Made in USA. Rag & Bone "Pearson" vest with pea coat-inspired details. Approx. 29.5"L from shoulder to hem. Peak lapels; double-breast button front. Rag & Bone "Pearson" vest with pea coat-inspired details. Approx. 29.5"L from shoulder to hem. Peak lapels; double-breast button front. Detachable self-tie belt. Front welt pockets. Relaxed fit. Hip length. Wool/nylon. Dry clean. Imported. Model's measurements: Height 5'10"/177cm, bust 33"/84cm, waist 25.6"/65.2cm, hips 35.8"/91cm, dress size US 2-4/FR 34-36.